“Wharton School Dean’s Medal” --- awarded by the Wharton School, University of Pennsylvania on 5 June 2004, to recognize his pioneering entrepreneurship in China, visionary leadership in establishing a range of global and extraordinary businesses, and contribution in creating value, jobs, and wealth for many. “Order of the Sacred Treasure, Gold Rays with Rosette” --- awarded by the Government of Japan on June 13, 2001, in recognition of his distinguished and commendable service and contribution to the development of Japan-Hong Kong economic relations, and for actively promoting cultural exchange and mutual understanding between Japan and Hong Kong. “Silver Bauhinia Star” --- conferred by the Government of the Hong Kong Special Administrative Region in 2002, to persons who have taken a leading part in public affairs and/or voluntary work over a long period of time. K.P. Chao was one of 25 Hong Kong individuals who received this award in 2002. “The Order of Agricultural & Industrial Superiority” --- presented by the Portuguese Government in 1987. Honorary Citizen: Shanghai, Ningbo and Zhuhai, China. In 1999 the International Minor Planter [asteroid] Naming Commission approved the naming of asteroid #4566, discovered by the Chinese Academy of Science's Zijin Mountain Observatory outside Nanjing, after K.P. Chao. K.P. Chao is one of Hong Kong's most renowned industrialists, a former member of the Hong Kong Consultative & Selection Committee, Chairman of the Board of Novel Enterprises, Honorary Chairman of Dragonair, and former Honorary Consul of the Republic of Mauritius in Hong Kong. K.P. 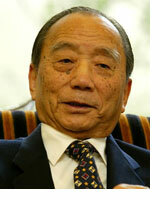 Chao was born in Shanghai in 1920. Although he excelled academically, at age 17, he was forced to abandon his studies and become the breadwinner of the family when his mother passed away and his father became seriously ill.
K.P. Chao moved to Hong Kong in the early 1950s where, after encountering many hardships, he imported dilapidated wool-spinning equipment from England and opened a wool-spinning factory. Building on his base in wool spinning, he pushed production another step further downstream by opening Hong Kong's first knitwear factory. As a result, K.P. Chao earned the moniker, "King of Hong Kong's Wool Industry." Driven by his determination and entrepreneurial spirit, K.P. Chao carried a suitcase full of his knitwear products to Europe in the mid-1960s in an attempt to open the market for Hong Kong's textile and garments. Having witnessed the devastation and extreme economic difficulty resulting from the Cultural Revolution, K.P. Chao opened dialogue in 1978 with the Chinese Central Government through the China Textile Import & Export Company. After lengthy discussions, the Central Leadership approved his suggestion of setting up a joint-venture wool-spinning factory in China. In the same year, the Xiangzhou Wool-Spinning Factory began operations in today's Zhuhai Special Economic Zone. This marked the beginning of "compensation trade" and "San Lai"i compensation tradei , both of which contributed markedly to the subsequent opening of China to the rest of the world. During his final Southern Tour in 1994, Deng Xiaoping made a special trip to visit the Xiangzhou factory to reaffirm the historic significance it represented. The political and economic significance of K.P. Chao’s determination in establishing this factory in 1978 before the Full Session of the Third Plenum of the Eleventh Congress cannot be underestimated. When Chairman Jiang Zemin received K.P. Chao and his family members at Zhongnanhai in August, 1997, he pointed out, "You are the first person to build a factory in the Mainland [after the Cultural Revolution], of this there is no dispute. In the early- to mid-1980s, K.P. Chao made numerous investments in China through Hong Kong Macau International Investment Co. Ltd., Novel Precision Machinery Company Ltd., and Novel Technology Development Ltd. Such investments spanned industries ranging from chemicals to electronics to steel. At one time, Novel was the sole distributor for INTEL in Greater China, Hong Kong and Macao. These investments contributed significantly to the development of the Chinese markets at the time. Throughout the 1980s and 1990s, K.P. Chao invested in more than 50 major Chinese projects from Heilongjiang Province in the north to Zhuhai and Shenzhen in the south. The textile production scale of his wool-spinning and woolen factories in Zhuhai is among the largest in the world. There have also been a number of large-scale investment projects in Shanghai, including Novel Color Picture Tubes Company Ltd., which is one of China’s largest color picture tube manufacturers; two commercial real estate developments: Novel Plaza on Nanjing Road and Novel Building on Huaihai Middle Road, where the Novel Department Store is located; and two multi-tower residential real estate development projects, Novel Garden and Novel City, in bustling Xuhui district. His latest investment in China is a partnership with International Textile Group (USA) to establish a denim factory in Jiaxing, Zhejiang Province. After completion, this will be one of the most advanced denim factories in the world. In 1985, in order to promote economic, cultural, and human capital exchanges between Hong Kong and China, K.P. Chao established Hong Kong Dragon Airlines Ltd. (Dragonair). In the earliest days of Dragonair, K.P. Chao expended much personal effort traveling between Beijing and Hong Kong to secure the support of both the Chinese Central Government and the British Government. Dragonair developed from a single-plane "when-it's-in-the-air-there's-nothing-on-the-ground" airline into today's regional carrier with over 30 aircraft. With more than 3,500 employees, Dragonair connects major cities throughout China as well as trunk cities in the Asian region. The company has not only played a role in developing Hong Kong's economy, but it has also been indispensable in developing Hong Kong as the center for travel and economic cooperation between China and the surrounding region. Under K.P. Chao’s leadership, the Hong Kong-based Novel Group, has also been very active over the past decades in developing and expanding its business overseas. Novel established its first wool-spinning factory in Mauritius in 1975, with a second manufacturing facility in operation the following year. In 1988, Novel moved its denim production from Hong Kong and Macao to Mauritius to establish a denim production base in the country. Novel’s production in Mauritius continued to expand with over 10,000 employees in one location, and reaching sales of US$80 million in 1995 and US$100 million in 1997. Novel Denim, the Group’s vertically integrated denim weaving and garment manufacturing business was listed on the NASDAQ until 2005. In recognition of his remarkable contributions to the development of Mauritius’ economy, at the invitation of the Mauritian government, K.P. Chao assumed the title of Honorary Consul of the Republic of Mauritius in Hong Kong until 2004. This appointment was sanctioned and recognized by the Chinese government. Another corporate entity of the Novel Group is South Ocean Knitters, a vertically integrated, worldwide knitwear manufacturer established in 1974. The company is headquartered in Hong Kong, but has subsidiaries and production facilities in Bangladesh, China, and Vietnam. Annual volume is 45 million pieces of knitted garments. South Ocean’s clients include some of the largest global branded apparel companies and retailers such as Calvin Klein, Donna Karan, GAP, Polo, Tommy Hilfiger, Kmart, Federated and Eddie Bauer in the U.S.; Marks & Spencer, BHS, Diesel, and NEXT in Europe; and Uniqlo, Jusco, and Ito-Yokado in Japan. In the late 1980s, Tommy Hilfiger USA, a small New York-based men’s sportswear designer, was one of South Ocean Knitters’ customers. Seeing the company’s growth potential, Sportswear Holdings Limited (SHL), a 50-50 joint-venture company owned by the Chao family and its partner Lawrence Stroll and his family, acquired Tommy Hilfiger in March of 1989. Under new management direction and continued strategic development for three years, the company was listed on the New York Stock Exchange on September 29, 1992. Revenues for the first fiscal year after the IPO were US$139 million. SHL exited this investment in July 2003, with revenues for the year ended March 31, 2003 of approximately US$1.9 billion. On January 30, 2003, SHL together with Michael Kors himself acquired all the interests of Michael Kors LLC. Mr. Kors is one of America’s preeminent designers specializing in luxury sportswear. His namesake company, established in 1981, produces a range of products in his Collection and KORS lines. Michael Kors labels include women’s and men’s ready-to-wear, women’s shoes, handbags and eyewear, as well as a full line of fragrance and beauty products for both men and women. Michael Kors’ flagship store is located on Madison Avenue in New York City, and its Asian flagship store is in the Aoyama district in Tokyo. A collective reference to three of the most popular export reprocessing agreement types of the time in which the foreign party provided: (1) raw materials for processing; (2) parts for assembly; or (3) product design/sample for processing/assembly in China. Made contributions to Tsinghua University, Zhejiang University, Ningbo University, Shanda University, as well as other educational donations totaling over ¥300 million [=US$38 million]. K.P. Chao has assisted more than 50 Mainland students go overseas for advanced training since the beginning of China’s Reform and Opening-Up policy.